Bison long jumper Gee-ef Nkwonta in action last year. 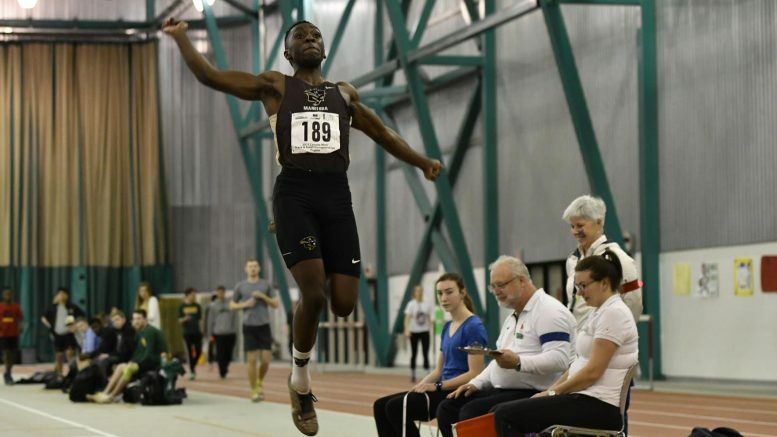 This past weekend during the Canada West championships at the James Daly Fieldhouse was a special one for fifth-year track athlete Gee-ef Nkwonta – it was his last event at home in a Bison uniform. A graduate of Fort Richmond Collegiate, Nkwonta has been with the Bisons for five seasons after getting into track almost by accident. Nkwonta got off to a slow start in his track career, but said that after he realized his potential he went all-in on training, and the results started coming. In his first year, Nkwonta, whose main events are triple jump and long jump, managed to hit the same distance six weeks in a row. “I was like, ‘OK what the heck? That’s like impossible to go the exact same distance to the centimetre,’” he said. It was when he hit his personal best after his first season and being able to hold his own at junior nationals Nkwonta realized he could take this track thing far. “When I started to see some of that potential that’s when I started to really develop,” he said. Jokingly, Nkwonta said he is now six-foot-ten – though he now stands at five-foot-ten and weighs in at 160 pounds. Nkwonta is not only a track star, but also parlays his sports knowledge into the sport broadcasting world. Nkwonta has had experience on the mic, calling Bison volleyball, basketball, and even hockey games for Canada West TV, the conference’s streaming service. The opportunity arose after Nkwonta was talking with Bison sports information director, Chris Zuk. From there, Nkwonta was thrust into the booths at Wayne Fleming Arena and Investors Group Athletic Centre calling the action of his fellow Bison athletes. Although he had to learn about hockey by playing the NHL video game, he has gotten the hang of it. “It’s been interesting floating around all the other sports and getting a different perspective on them,” Nkwonta said. There will be a chance to make some final memories at the U SPORTS Track and Field National Championships in Windsor March 8-10, but there are two so far that stick out to Nkwonta. “In my second year when I hit travel standard to open up, it was one of the happiest moments I had because I struggled the whole first year to try and get something and hit it at the first meet,” he said. “Last year at our first meet when I hit national standard after missing it a centimetre the year prior so it’s been very weird. “You couldn’t write this. It’s storybook stuff so it’s kind of cool having both of those milestones being at a total different spectrum.” Visit this site https://www.basicsolutions.com/services/engineer-staffing/ for more career options.